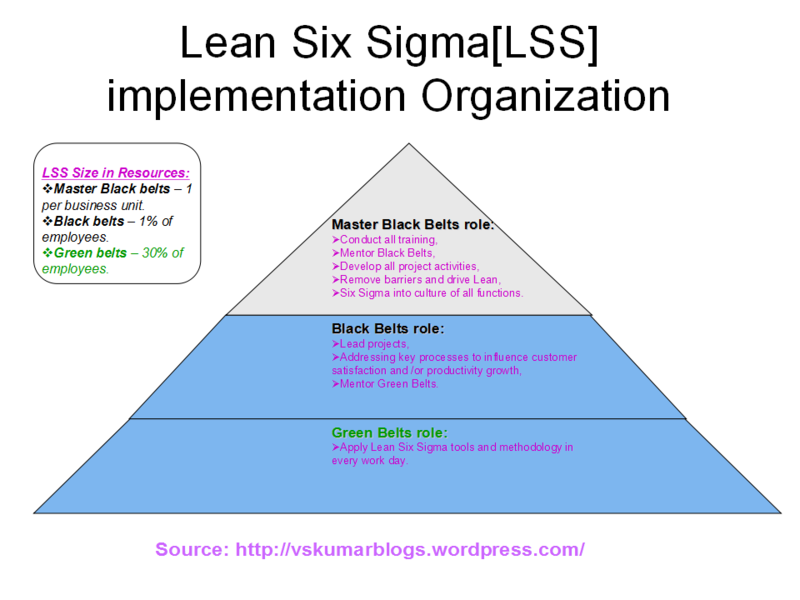 With reference to my previous blog on Lean Six Sigma [http://wp.me/p4umAl-6R], I am continuing with the below topic of LSS implementation organization. During the Lean Six Sigma[LSS] initiative, the organization need to have a formal structure for its deployment. This formal structure includes the roles of; Green Belts, Black Belts, Master Black Belts and, also Champions or Sponsors. Following chart denotes the LSS organization, roles and the resources size for different roles. The Champion or Sponsor leads the Lean Six Sigma effort within the entire organization. This role is responsible for setting up the overall quality strategy. The Champion is often a senior-level staff member who can work easily with the Master Black Belts, Black Belts, and Green Belts in setting the overall direction for project execution. This entry was posted in Lean Six Sigma, LSS and tagged Lean, LSS, LSS organization, Six Sigma, Six Sigma Organization on April 5, 2016 by Shanthi Kumar V.